Fetlar is looking forward to the opening of its new pier and breakwater on Saturday 1st December. Following the opening which will be taking place at 1pm, there will be a dance in the hall on Saturday evening, full details, icluding buses and late ferries on the whats on page. Fetlar Developments Ltd is also recruiting for a new Fetlar Tourist Development Officer, closing date for this post is 5pm on Thursday the 6th of December.Full details are available on the situations vacant page. 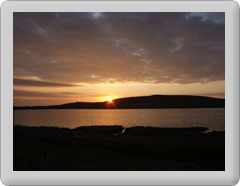 Look out for the next newletter from Fetlar in early December. If you haven't signed up yet for your copy, its easy, just register for our mailing list, using the link on our home page. As well as a full report and pictures from the pier opening, we plan to have a photo feature on the latest property built on Fetlar.